CARACAS, Venezuela - President Nicolas Maduro was unsurprisingly declared winner of Venezuela's election Sunday in a poll rejected as invalid by his rivals, who immediately called for fresh elections to be held later this year. Maduro hailed his victory for another six-year term as a "historic record" in a speech to thousands of cheering supporters outside the official Miraflores Palace in Caracas. "Never before has a presidential candidate taken 68 percent of the popular vote," he said, to applause. "We won again! We triumphed again! 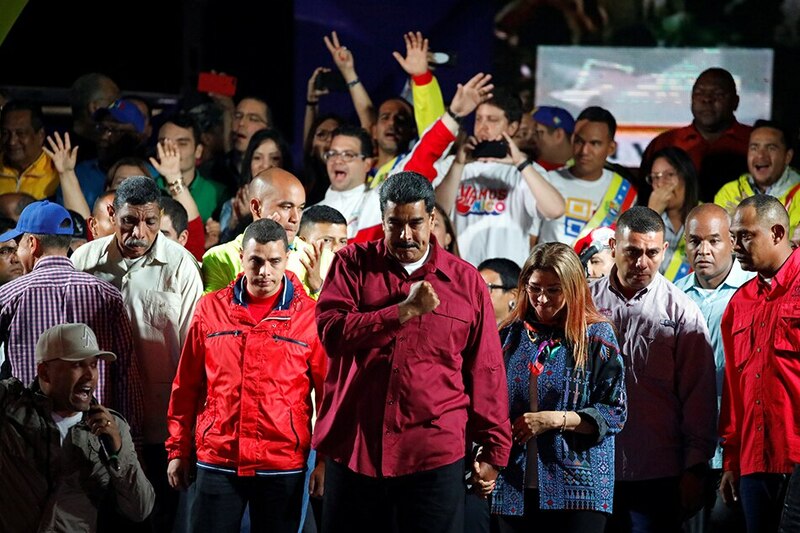 We are the force of history turned into a permanent popular victory," said Maduro. In a news conference held before the official result announcement, he pointed particularly to so-called "red points" -- street stalls set up by the ruling Socialists near polling stations -- allegedly to offer handouts in exchange for votes. "I am not taking part in this fraud," said retired teacher Maria Barrantes, 62. "What we are living through is a disaster." "For the first time in my life, I am not going to vote because we are living a dog's life, without medicine, without food," said Teresa Paredes, a 56-year-old housewife. But Rafael Manzanares, 53 and living on government handouts, said he believed Maduro's claim that "things are bad because of the economic war" against the country. Aware of the popular mood, Maduro had vowed an "economic revolution" if reelected. Falcon promised to dollarize the economy, return companies expropriated by Chavez and allow humanitarian aid, something the president rejects. Falcon said fresh elections could be held in November or December, when they are traditionally contested, but they were moved up this year by the country's all-powerful and pro-government Constituent Assembly, catching the divided and weakened opposition off-guard. The Democratic Unity Roundtable (MUD) opposition coalition has won support from the United States, the European Union and 14 countries of the Lima Group who called for the vote to be postponed. Despite holding the world's largest oil reserves, the country faces ruin, with the IMF citing a 45 percent drop in GDP under Maduro.